20 days ago we covered Luke Bozier, social media expert and ‘new Tory’, and his strop where he quit Twitter for good. But now, the good (or maybe bad!) news is that he’s back. Well kind of back. His profile is back, although it is not his any more. We’ve now got Bozier-by-proxy (well not quite, but you know what we mean). Surprisingly, although a fake account, it hasn’t been as uncomplimentary and offensive towards Mr. Bozier as it was first thought it would be. The owner of the account seems to have gone for more of a ‘mickey-take’ at the moment rather than being offensive – which seems to be going down pretty well in the world of Twitter. “Guys, I’m thinking of changing the font in Menshin’s logo to something more modern & cool. Comic Sans MS or Papyrus?”. “Peter Hain’s hacking is a further sign we need to be able to monitor all internet traffic. #IAgreeWithLouise“. We can’t help but feel that they’ve missed the #sarcasm off the last one! So, now celebrities (or mediocrely popular people) now need to really think long and hard before abandoning their online profiles. With websites such as Twitter, as soon as a person closes down their Twitter account, anyone, anywhere can instantly recreate it and do what they like with it. This recent action of recreating the ‘Bozier’ account would seem to suggest that if celebrities (or mediocrely popular people ;)) want to leave a social networking site, they are better just to leave quietly, not delete their profile and never log in again. There’s also another benefit to this – in a year when you decide to come back to the website, you don’t have to recreate your account again – you’ll just be able to log in to your old (new) profile!! And by the way, just in case you were wondering, Bozier’s “fan site” that we reported on a while back is still up. 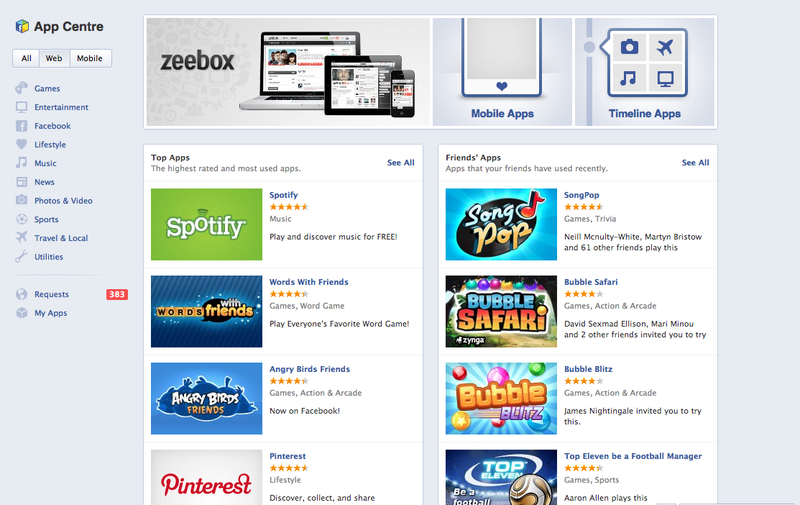 SongPop – The New Addiction on Facebook and How To Get More Games! A couple of days ago, our regulars will remember that we posted an article regarding SongPop, the new Facebook social media music trivia game! We’ve been evaluating it for a while no and we’ve got to agree that it is definitely addictive! And from the number of people that we see playing it at all times of the day (presumably while some of them should be working! ), we can quite confidently say that its heading to be (if not already) one of the most popular games on Facebook. SongPop’s popularity was greatly increased when it received a recommendation from none other that the Facebook founder and Chief Executive Officer Mark Zuckerberg, who said “Song Pop is one of the most fun Facebook games I’ve played in a while”. And we tend to agree with him!!! More Popular Than Draw Something? Not only that, an article in the Guardian last month said that SongPop could overtake the other fans favourite Draw Something within a month (which is round about now! ;)). So there’s two versions. On the App Store anyway. Is there two on Facebook? Can’t remember seeing two or how that would be implemented…. but anyway I digress! There’s two versions, a free version and a premium version. So, what’s the difference? Well the free version, is err….. free ;). I know, shocking! And the premium version is an upgrade to the free version, and currently available in the App Store for £1.49 – which we think is a very reasonable amount for a game that you are likely to spend nearly every spare minute in the day on! – at least for a few months anyway! From today’s hits to classic rock, start with 6 playlists – there’s something for everyone! Play with thousands of songs from Golden Oldies to today! Invite your friends to quick challenges and see who has the best music memory. Unlock new playlists featuring more genres, more artists, and special song collections. So, as you can see, lots of nice features in the free version – and regardless of which version you are thinking of getting it’s always worth trying the free version first and checking that it is for you (which it most likely will be!). Play with twice as many friends at once! Extended, HD quality music clips. There’s some nice little extras in there for not much money, so it’s well worth the £1.49 in our opinion. Extra Tip To Get More Games! However, if you want to stick to the free version for now, that’s OK – we’ve got a tip for you. In the free version you are limited to 20 open games or challenges at the same time. This can be frustrating, especially if you fall in love with the game (like we did!). After you’ve got 20 open games, when you click ‘Create game’ within SongPop, it tells you to delete (end) another game first. Well that’s a bummer! However, regular Facebook users out there will likely have amassed a small army of Facebook friends. How does that help you? Well even after you’ve got 20 games open, you can still challenge people from your friends list to a game – and go well beyond the 20 open games limit. Is this a mistake or a bug? Or is it deliberate? Well, we’re not entirely sure. There are reasons for both. It could be a mistake. Maybe it’s a bug that slipped through the net. This would be a fairly simple explanation to understand it. Or, it could be deliberate. SongPop is a social media game. The key word here is ‘social’. It’s beneficial for the developers for more people to play SongPop – as the more people there are, the more people that might pay for the premium version and increase revenues for the developer. Also, new players are good for existing players as there are more players in the ‘players pool’ to possibly play against. By allowing you to challenge (therefore invite) an unlimited amount of your Facebook friends the SongPop game and it’s player pool should develop at a much faster rate. However, the one downside would be that if this is deliberate, it ‘devalues’ the premium version (kind of) as one of the premium features isn’t necessarily needed – the ability to have more games. SongPop is an excellent game. It gets a definite recommendation from us! Make sure you’ve got a few hours spare when you first play it – most likely you’ll need them! Both the free and the premium versions are excellent – and in our opinion, the premium version is well worth the small price tag. Plus, you never know, you might go for a ‘random’ challenge and end up playing against the Original Facebooker, Mark Zuckerberg! And with that combined with all the features of the fantastic game that is SongPop, it truly is a irresistible prospect! Twitter – Do Following Limits Protect Or Stifle Our Social Websites? So Twitter is undoubtedly ‘up there’ with the top social media websites in the world, possibly second only to Facebook. Twitter ‘following limits’ get a lot of bad press but is this well deserved? Do the following limits protect the website from being abused by spammers? Or do the following limits harm legitimate users more than they hinder spammers? Twitter enforces certain limits on how many accounts you can follow in total and over a specific short period of time. It also has rules over how many changes you can make to who you follow. Each account can follow 2,000 other accounts. You are unable to follow more than 1,000 accounts in any one day. You are not permitted to ‘aggressively follow’ other accounts. So each account can follow 2,000 other accounts – that’s fairly self explanatory. Now I know what you are thinking, you’ve seen other accounts following more than 2,000 accounts? Right, yes, it is possible – but it becomes quite complex. No matter what you account is, verified or not etc you can follow 2,000 accounts in total, no questions asked. After that, the amount of accounts you can follow over 2,000 is determined, on a basic level, by the number of people following your account. The number of followers you have gets put into the ‘Twitter formula’ which then calculates the total number of extra accounts you can follow over 2,000. Now this one really is self explanatory (and probably the one we agree with the most). There’s no exceptions to this one. You can’t follow more than 1,000 accounts a day – and there really is no legitimate need to…. unless you’re a spammer of course, but that’s precisely why these rules are in place! ;). So, you’re also not permitted to ‘aggressively follow’ other accounts – but what does this mean? Does this mean you can’t send a tweet to people you follow with a menacing, threatening picture? Well not quite (although that’s probably not a good idea either!). ‘Aggressive following’ refers to lots of following / unfollowing over a short period of time – basically a tactic used to negate the effects of the other rules. Why would you do this though? What benefit could it possibly have for you? Well, lets investigate. Those of you that have an account on Twitter and have been on there a while will probably know that sometimes, when you follow an account, they follow you back and vice versa. For users who have account notifications turned on, they will also get an e-mail about your new follow. The e-mail will contain a link to your Twitter account and a link to follow the person back. Then, they can end up building followers up quite fast and more followers = higher number of accounts they can follow. And this in turn means they can do the trick above to more accounts concurrently. And so the circle repeats…..
Well the topic is definitely a controversial one. Firstly, the rules do appear to stop some spammers – but by no means does it actually stop spam. We still get plenty of it. But maybe the problem would be a lot worse if these rules were not in place? Does it hinder legitimate accounts? Probably. SME’s for example are likely to follow more than they are followed as they startup or break into a new industry. They are likely to be caught by the following limits. Do the rules have any other effect? Well, we think so. The rules can make people ‘stingy’ with their followbacks. Something that someone may ‘Like’ on Facebook, they may not follow on Twitter. Why? Well to preserve their follows – they will also have a limited number don’t forget! In conclusion, its probably fair to see that the following limits both protect and stifle our use of the site to some degree. But which would be better? Following limits or no following limits? Well, we’re not too sure. Obviously it’s annoying to hit a follow limit if you are using your account legitimately. But equally, it would be annoying to be spammed all the time. Twitter are most likely trying to protect themselves from the deluge of spam that normal comes with running a popular website. Remember MySpace? At one point they seemed to be getting totally overrun with spam – so you can’t really blame Twitter for wanting to protect themselves from this threat. After all, they would not want to face the same decline in usage as MySpace has done over recent years. We’ve been waiting a little while for a new social media game to come along – one which can restore our faith in gaming and give us a reason to surrender countless more hours than we intend to our social networking websites. And it’s here. Love social networks? Love music? Well you’re going to be in gaming heaven now then! SongPop is the latest popular game to hit the scene, where you compete against your social media friends with the aim of guessing the artist or song title faster than your friend. It is a turn-based game, so don’t worry, you don’t have to devote hours at a time to it (but you most likely will!). 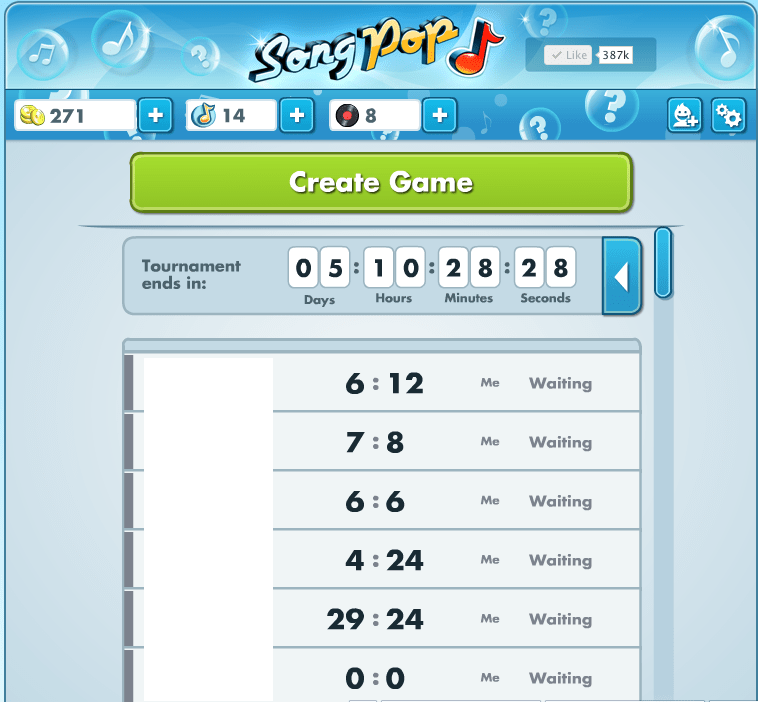 The developers describe SongPop as “the most fun music trivia game to play with friends”. Numerous different categories (or playlists) are available – at first you start off with a few categories such as 80’s and 90s but by playing games you earn coins (more for a win obviously!) and these coins can then be used to ‘buy’ more playlists and make them available for selection. There’s playlists to suit everybody including lists such as 2000’s rock, modern rap, 60s and many more….. there’s even a Glee playlist! (it’s pretty cool by the way!!). As you play each category (playlist) you ‘progress’ in your knowledge of that playlist and the more progress that you make, the more songs that get unlocked. SongPop is available on Facebook, iOS and Android. SongPop is free but there is also a premium version which you can upgrade to for extra features, which currently costs £1.49 in the App Store. SongPop was developed by FreshPlanet Inc, a New York based company created by two web entrepreneurs (who also happen to be brothers). This is a truly addictive game! Make sure that when you start playing you’ve got plenty of time spare – you may find it hard to pull yourself away!!! Facebook are a massive social networking website (as if we didn’t know!) and most definitely no stranger to making changes to the website. These changes generally have the perception of being unpopular – possibly down to the fact that people satisfied with the changes are quite quiet whereas those dissatisfied like to make their dissenting opinion heard! Either way, Facebook ploughs forward with changes in the name of progress and the latest change is the addition of ‘App Centre‘, which we have to say is a really great idea (in our opinion anyway!). There’s really two kinds of ‘Facebookers’. Those who love requests and those who loathe requests. The lovers are hanging onto their keyboard, eager for the next free Farmville animal to be gifted to them by a friend while the loathers have a constantly red clicking finger from pressing ignore on hundreds of requests. Well, for both lovers and loathers, App Centre is a good addition! The grouping of the same requests from different friends means that if 10 friends invite you to play the next new game, rather than having 10 individual requests from each of them to play said game, all 10 requests are now grouped as one request. So when you accept the request, you in effect, simultaneously accept all 10 requests and you only have to visit the game once. Excellent! But what about for the loathers? Well don’t worry, the grouping is good for you as well. App Centre doesn’t help with regards to not receiving requests (that’s what blocking application requests is for! ), however in the same way grouping works for lovers it works for loathers. 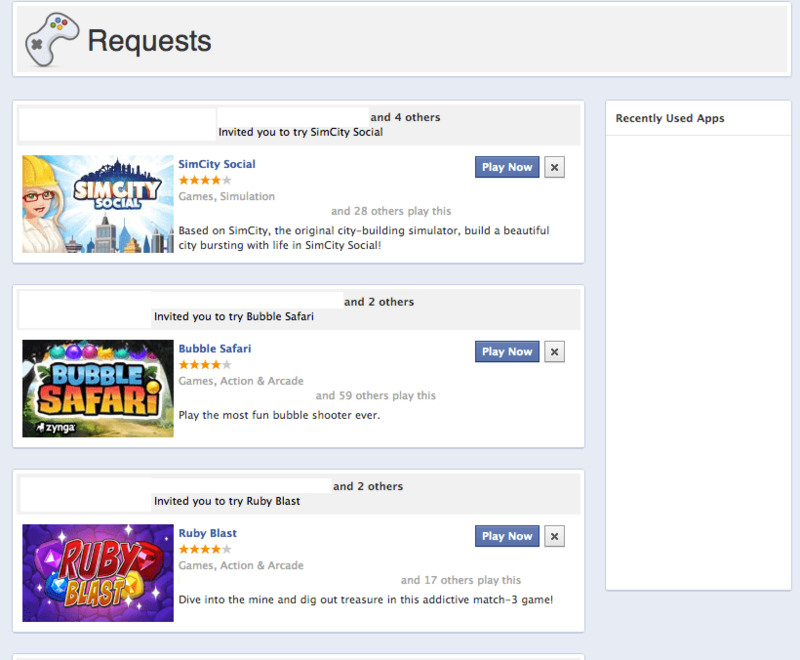 As similar requests are grouped, clicking the ignore button will ignore the entire group of identical requests from different friends, thereby making it easier to manage application requests. Obviously as well the usually blocking requests by application and blocking requests from certain friends is still available. In addition to this, the App Centre also has a run down of the top games, which ones are most popular, which ones friends are playing etc. Think of it as a mini App Store with a few social media functions thrown in for value added content! PS – We’ve got to admire the attention to detail as well, even though Facebook is an American company, they’ve remembered to spell ‘Center’ as ‘Centre’ for the UK version. Bravo Facebook! :).